Luxury accommodation provider Unique Home Stays is set to feature on the small screen after taking part in a brand new eight-part observational documentary series, the first episode of which will be aired on January 2nd 2012. The primetime ITV1 series called ‘Cornwall’, will take in some of the delights of the beautiful and rugged county over the course of a Cornish summer. Each episode includes stories about life in some of the county’s most scenic towns and villages and features characters from its communities. The beautiful and truly unique properties offered by Unique Home Stays are shown in the programme as part of its focus on highlighting tourism in Cornwall and the range of beautiful places to stay on offer in the county. 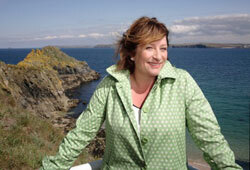 The eight-episode series is being presented by actress Caroline Quentin, who has been filmed visiting properties with Unique Home Stays’ marketing manager Claire Ray and retail manager Jess Clark. The production company behind the show, Twofour, have had previous success with shows such as the long running 'Hotel Inspector', and the BBC's inspirational 'Harry's Arctic Heroes'. Unique Home Stays’ Marketing Manager Claire Ray said: “It’s such an exciting series for Cornwall and we can’t wait to see the final version aired on national TV!